Pregnancy is a wonderful miracle, but it’s not without its risks. Many times, babies born before the 37-week mark are at an increased risk for medical complications during and after delivery. A process called umbilical cord milking, however, may improve the health outcomes in preterm babies. During pregnancy, a developing baby gets his or her blood from the mother. At birth, approximately one-third of the blood given to the baby remains inside of the placenta and the umbilical cord. Cord milking is a process in which much of this blood can be delivered to the newborn’s body once it is born. The process of cord milking is simple. During the cord milking process, a doctor leaves the umbilical cord attached to the baby after birth. Starting near the placenta, the doctor pinches the cord between two fingers. With gentle pressure applied, the fingers are slid down the cord, a process that neither the baby nor the mother feels. This process of squeezing and sliding moves the contents of the cord toward the newborn, transferring the contents from the cord into the body of the baby. The blood that a baby receives from the mother is rich in hemoglobin and nutrients. By transferring blood from the cord to the infant’s body, the newborn starts life outside the womb with the most nourishment as possible. How Does Cord Milking Make a Difference? Preterm infants experience more medical complications than their full-term counterparts. For example, babies born before 37 weeks of gestation are at an increased risk of anemia. This condition, in which the blood has insufficient red blood cells, can deprive the body of essential oxygen. Without sufficient oxygen delivered to the brain and other parts of the body in the time period following birth, affected individuals may experience developmental problems that can have lifelong effects. These insufficient levels may then impact such areas as motor skills, learning abilities, memory retention or IQ levels. Cord milking may be able to reverse this chance of developmental issues even more so by increasing blood volume in preterm newborns who are delivered by cesarean section. Research has shown that C-section babies who receive cord milking have greater blood flow from the brain to the heart. They also have a higher volume of blood going from their hearts to the rest of their bodies. Related to this increased blood flow is the higher blood pressure that has been observed in these infants. Furthermore, with C-section newborns who receive cord milking, hemoglobin levels are higher. These high hemoglobin levels are associated with red blood cells of a higher quality. Delayed cord clamping is the standard recommended practice for preterm babies who are delivered by C-section. In delayed cord clamping, a baby’s cord is not clamped until it stops pulsing. The pulsing indicates that there is still blood moving from the cord to the baby. It can take one minute or more to complete this process. Cord milking, on the other hand, takes only a few seconds. Both practices allow for the transfer of cord blood to the newborn, but cord milking takes less time than delayed cord clamping. Research has indicated that cord milking is, indeed, more effective than cord clamping for preterm newborns who are delivered by cesarean section. In those born before 33 weeks, cord milking has been shown to produce higher hemoglobin levels. Compared to preterm babies who received delayed clamping, the milking group was less likely to need oxygen a few weeks after birth. These same benefits of cord milking have not yet been shown for preterm babies who are born vaginally. 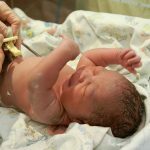 Studies have shown that outcomes for vaginal preterm births are similar whether the infant receives delayed cord clamping or cord milking. This may be because the uterine contractions are stronger or more effective in a vaginal birth, so they are better able to move blood from the placenta and cord to the infant. While the practice of cord milking may not hold an advantage over delayed cord clamping in a vaginal birth, only about 10 percent of preterm infants are delivered vaginally. For the approximately 90 percent who are delivered by C-section, cord milking could have long-term positive effects for the baby. For pregnant women, especially those with risk factors for preterm birth, who are curious about cord milking discussing this option with their doctors should be integrated into their birthing plan ahead of time.